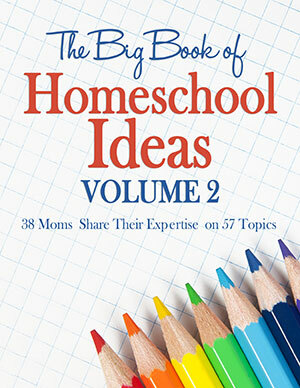 We have been amazed by our support system of family and friends on our homeschooling journey. I mean, really amazed. We get tons of suggestions, lots of understanding, a fair number of questions, but few truly critical remarks, even though our lifestyle is different than, oh, everyone else we know in person. 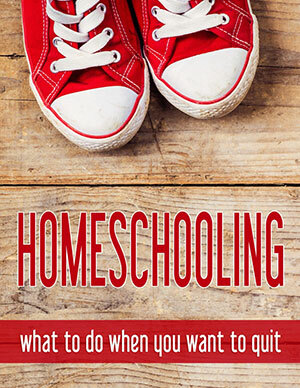 I know that so many homeschoolers, even ones WAY more traditional than we are, aren’t so lucky. 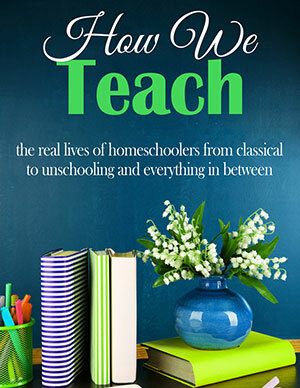 So that’s why I decided to participate in the iHomeschool Network’s Answering the Homeschool Critics linkup today – not because I get a ton of criticism, but because I want to show that homeschooling, unschooling, and radical unschooling can stand up even against the harshest critics. I definitely also want to share some of the ways we respond when hurtful or critical remarks come our way. Much of the time, the people making these remarks aren’t even trying to criticize – they’re just well outside their comfort zone. So my hope today is twofold. First, I want to reassure those of you who’ve faced criticism that you can handle it – and that your family’s approach, even if it’s radically different, can withstand it. Second, I want to share some answers I give to kind of the “frequently-asked questions” or challenges that do come our way, so that those who are reading who maybe really don’t understand where we’re coming from can hear a little more about what we do and why we do it. If you haven’t already seen it (or if it’s been a while), I encourage you to read our unschooled version of a seventh-grade-ish curriculum plan for 2012-13 and our unschooled version of an eighth-grade-ish plan; you’ll get the idea pretty quickly. We don’t do assignments. We don’t do tests. We don’t do subjects. We certainly don’t do grades. And we have loose ideas and interests, but when they change, we’re willing – and in fact geared toward – following them and leaving other interests behind. I’ll ask you the same question: As an adult, if you need to know something, are you able to learn it? I hope the answer is yes! So can Sarah. But needing to know is the key. Sarah is already learning the things she needs to know to live her life. You might not know how to halter an alpaca and show its teeth for judging. She does. You might not know that alchemists were the first to document changes in states of matter, a key development in modern chemistry. She does. You might not know the entire Mythbusters series almost by heart. She does. In turn, you probably (and hopefully) know lots of things that other people don’t. That’s awesome. It’s what makes you able to live your life – a collection of specialized knowledge that has relevance in your world. Sarah knows that there will be times when she needs to know something she doesn’t currently know. But she knows how to learn it. Do you get tests? Grades? Maybe a performance review at work, or grades if you’re a college student, but come on. Is that how you look at your life on your birthday or on New Year’s Day and think, “Wow, did I get anywhere this year?” I don’t look for a number on a page to tell me that. Neither does Sarah. That example sounds silly, but we’ve got to stop second-guessing ourselves and our kids. Talk to them. Spend time with them. If you don’t see the ways they’ve grown and changed and, yes, learned over the days and months and years, spend more time. Talk more. Listen more. Remember the guy pictured at right? 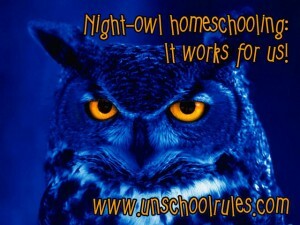 He’s from a post I wrote earlier this year about homeschooling as a night owl. In it, I mentioned that we often get questions and, yes, criticism about Sarah’s ability to be awake at 3 a.m. and asleep at 11 a.m.
“You’re hurting your daughter’s chances at getting a ‘real job’ someday.” I mentioned before that this was probably the most hurtful comment I’ve received. If Sarah wants to, she can and does get up to an alarm or a parental wake-up call. If she prefers, which she probably will, she’ll get a job that has her starting at 5 or 10 p.m. Hey, it worked for me and her dad! We trust our daughter to know her body and the times she’s most productive, and we make the same choices as adults for ourselves. It’s OK to be a night owl – or an early bird. We are so thankful that homeschooling allows us to work within our strengths, not schedule our lives at others’ convenience. I’ve written before about some of our “yeses.” Blue hair. A cell phone for a not-quite-teenager. Watching a movie I didn’t particularly think I was going to like. It’s a gross oversimplification, but that sums up our parenting style – and really, our family dynamic, because it’s not just about parenting. In general, people quickly realize that in our family, we don’t really do “rules.” We don’t limit computer/video-game time and, in fact, encourage it. “Aren’t you worried that ‘all’ Sarah wants to do is play video games?” Well, no. Mostly because it’s not all that she wants to do. She loves it, and she’s passionate about it, and she’s made the best friends of her life doing it. Oh, and she’s learned a ton of stuff too, not the least of which is to type (with accurate spelling) at about 90 words per minute, an employable skill if there ever was one. But the fact is, it’s not her only passion. We’d be OK if it was, but really, like most human beings, Sarah has a few key interests and divides her time between them. She’s allowed that freedom – and so am I, and so is Chris. Some days, I’m on the computer 10 to 12 hours straight working. Some weeks, I’m at tae kwon do class for almost 2 hours each evening. In our family, we don’t set up an artificial limit between what we can do and what Sarah can do. “Doesn’t that make you permissive or unconcerned parents?” That’s another criticism we hear. I say the opposite is true – we’re so concerned, so interested, so willing to be present that we take the time to be situational in our decision-making – not to rely on a “rule” for convenience. “And what about punishment? How can kids learn without consequences?” Well, punishment and consequences aren’t the same thing. We’ve essentially stopped any kind of “punishment” for Sarah because of natural consequences. Sometimes, she doesn’t make good decisions. Sometimes, I don’t make good decisions, and I face the consequences. So does my daughter. When we do have conversations about these topics – with people who are really interested, and not just being critical – I refer them to Sandra Dodd’s page on rules vs. principles. It’s a great read that I think helps explain our lifestyle, and why spankings or groundings or taking away privileges (all of which I admit we HAD tried in earlier iterations of our lives together) aren’t what we choose to do as a connected family. Update: About a week after I originally wrote this post, my friend Jen of The Path Less Taken wrote an amazing look at this topic called Does Unschooling Mean Anything Goes? I would highly encourage everyone to read it! How are other families dealing with their own critics? I’ve shared some of our response to the particular types of criticism our nontraditional approach to homeschooling – and life – sometimes gets. My friends in the iHomeschool Network are sharing today their responses to challenges that come up in their own situations – many very different, and many very similar to ours. I hope you’ll check them out here! 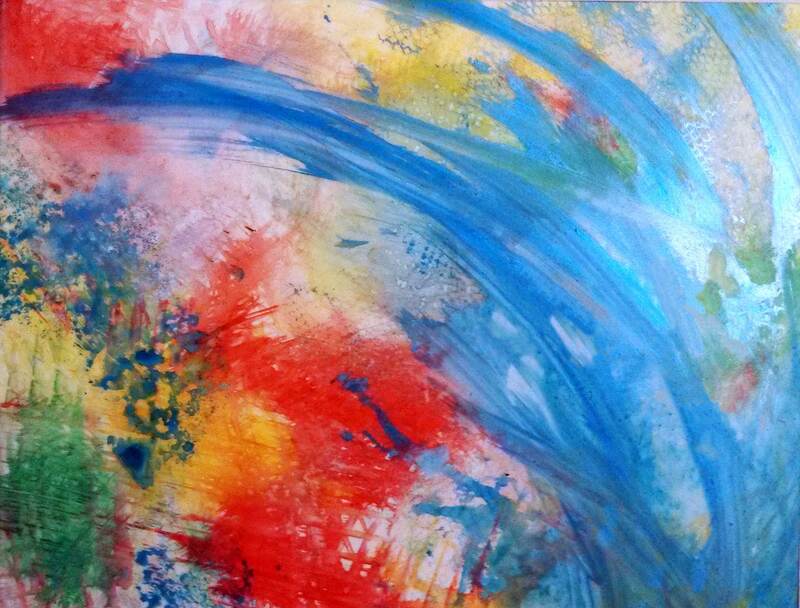 This entry is about homeschooling, parenting, philosophy, unschooling. The previous post was 10 great books about learning from life. The next post is 10 things you’ll find in the Conciliotto fridge. This is a fabulous post. Your “curriculum guide” for this past year was what led us to find Life of Fred and that changed Lilah’s experience with math. And I don’t think the walking analogy is silly, I think it is brilliant. It shows that the question itself is silly. I am so glad you are blogging your unschooling experience. I learn so much from your words. Jess, thanks! I appreciate you more than I can say. Hearing about your girls and knowing that there’s a way that I might have helped Lilah change her thoughts on math… that’s awesome, but even more awesome is being able to develop a friendship with you and see your lives through your blog! Thank you so much for stopping by and the kind words. I always find it strange when people use “permissive parenting” like it’s an insult. Why would it be a bad thing to permit your children to do things when there’s no good reason not to? I like your approach – so much of formal educating is just hoop-jumping, and with a bright inspired child it’s unnecessary. Some people, and I include myself in this category, need a bit more structure, but if Sarah needed more structure then I’m sure you’d provide it for her (or help her to provide it for herself). May, that is such a good point! It is not an insult. It is an insult to take away choices from a child that they are capable of making themselves. I so agree with you. The only thing you need to teach is how to find out what you want to know. I do have a bit more of a traditional style to our schooling in that I pick most of the topics we study and I try to cover a bit of everything, but I am very compromising and we often take off on branches of topics according to their interests, and we study the topics in the manner that interests them. What I don’t want to do is cause harm. I don’t want them to hate schooling and learning, which it seems most kids have developed. You do an amazing job with an amazing collection of unique and fun people entrusted to your care. I love seeing how your daughter has stepped up to help with her brothers’ schooling, and I know she’s learned so much from your example. I’m a “yes mom” too and I love your explanations for the critics. You are very blessed to not have to deal with critics. 🙂 I’m still a little hush-hush about how we do things sometimes and the freedoms I give my girls as much as possible. Luckily there are a few other relaxed homeschooling / unschooling families in our area that we see often, so we don’t feel totally alone! Amy, that’s one thing I’m missing: I don’t feel like I know anyone in my area who is even a little bit like me! I do know what it feels like to be hush-hush. While I’m totally open here, I admit there are people “in real life” who probably don’t know quite the whole story, though I would tell them if it came up. The problem is, how does that come up in conversation?! I’m not — I don’t know, bold enough? — to do this full out. But you inspire me and I love how you unschool. My 12yo does need more structure than Sarah; in fact, we’ve recently talked about that. But seeing how this works for y’all helps me figure out what areas to give her that structure and what areas to let it go. I don’t know about bold – maybe insane? 🙂 I love seeing what you guys are doing as well. There is something great about seeing the things we have in common despite the things that might seem different on the surface, which is one of my favorite things about homeschool blogging! Thank you so much for this wonderful post, Joan. It is SUCH a welcome breath of fresh air! I have so much respect for the way other people parent but when I read words like yours that resonate so deeply with my own values, it makes my heart sing. Thank you! Oh, thank you, Lucinda!! You made my day – my week! 🙂 Always glad to show you you’re not alone. Great post, alot to think about as we struggle to find the right way to h/s my DD8. Prayer and grace – that’s the only “right” I know in this whole mess! I pray your family will find exactly what works for you! Hello! 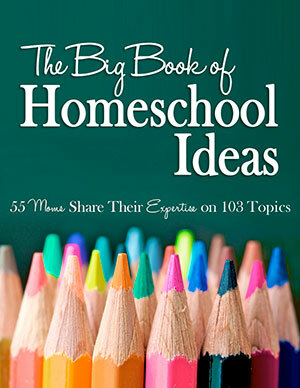 I’m from Argentina and belong to a homeschool group in Facebook where we share everything we can regarding homeschool. Someone shared your post and I translated it for the ones who do not read in English (hope that’s ok). Thank you very much for sharing all this, it’s very important for us all who are trying to make it work. Maxi, that’s AWESOME! I can now say I am read in multiple languages, can’t I? Thank you for doing that! This is really fantastic, and it’s inspiring to me as I parent my young kids (6, 4, 1 1/2, and baby on the way). We are Americans living in the Netherlands, where getting permission to homeschool is incredibly difficult. So our oldest two kids are in Dutch school for now, and the biggest benefit is that they’re learning a second language fluently in an immersion environment…the one thing I can’t give them at home! But I really embrace the unschooling principles in general for my parenting, and this post gives me some ideas about how I can do even more to encourage their natural interests and preferences and guide them to productive, enjoyable lives. I think you are so right – there is so much (maybe almost all) of “unschooling” and especially radically unschooling that is really about parenting. The traditional education part almost is irrelevant… you are describing your style and your family dynamics when you are all together. Just as many unschoolers choose to go to college, it may be that you use the Dutch school system as a tool, but make your own opinions about what kinds of “learning” matter, you know? Thank you for stopping by and sharing your insight! I think you really understand what I’m talking about – the kind of parenting that I try to embody! Hey! I am still! 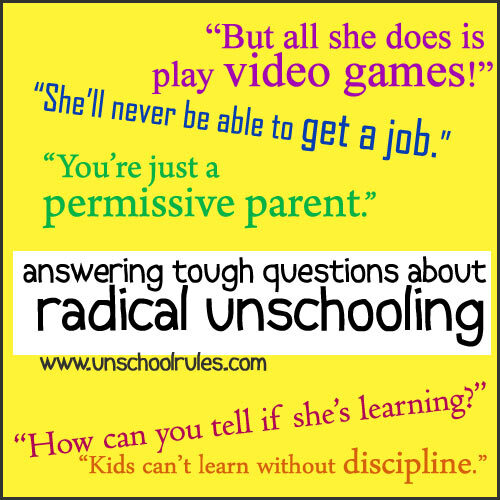 So confused about what radical unschooling is. Maybe you could email me? We’ve been homeschoolers since their beginning, the oldest being 9. But, we do Math-U-See because I love it and we never limit our education opportunities just because there’s a curriculum that clicks with us. But I’m assuming if you learned a foreign language , there’s just some subjects you learn this or that from either a certain site, specific class or even text/curriculum? We spend ALL the days together and if there’s something going on, such as a meeting, then there’s still family involved. I just wish it didn’t take so long for me to comprehend this way of life. I’m concerned it’s gonna take the whole experience for me just to have hindsight! Maybe call me confused in CA? AHAHAHAHAHA Not to mention I feel I wasted four years of college education learning to be a K-8 teacher. Alison, absolutely feel free to drop me at email at joan (at) unschoolrules (dot) com! I’m glad to chat. Essentially what you’re describing sounds a lot like interest-led or delight-directed learning, which is cool! The thing that seems most different between that and unschooling is the idea of requirements and value statements about types of learning – for instance, if one of your kids said, “I don’t want to do Math-U-See,” would that be OK? (It might not be, and that’s fine, but in true unschooling, there’s not an obligation to the kids to engage in such things, and there’s not a value statement about that as “learning math” any more or less than playing video games, going grocery shopping, etc. Again, that might not be for you, and that’s OK, but that’s what unschooling is. Radical unschooling, then, is one more layer on top of that, expanding beyond “learning” into life. It’s not enforcing arbitrary obligations or limits – for instance, in our family, we don’t limit screen time, we don’t “require chores,” etc. To your question about “some subjects” needing to be learned a certain way, well, we don’t really work in subjects, but when Sarah wanted to learn some Spanish words when friends of ours moved to Puerto Rico to be missionaries, she played with the DuoLingo app till she learned enough to whet her curiousity. It wasn’t an obligation or an assignment, it was just something I put in front of her and said, “Hey, you might like this” – and then would have been OK if she hadn’t done anything with it at all! Does that help? I’m not sure, but it’s just a few things I’ve thought of in response! I agree with you.I am also Very happy to see that I’m not the only one who’s schooling if mainly field trips. Reading comments, posts, and following people who do the same as us makes my journey a pleasant one. I have followed Joan on FB, Pinterest, blogs and more for many years. Another of my go to people when I need inspiration. Have a great day both of you! Kathy, glad you stopped by!! And I totally agree. I cannot believe how much better our lives are when we can connect (virtually, usually, but also IRL) with people who get our life! Oh my goodness. I am so glad I found your page! We as a family have decided to unschool our 15 and 12 year old boys. They were so miserable in school and with the curriculum changes were struggling to keep up. Since we pulled them out of public school last year they are finally happy. Both boys have very different learning styles and unschooing allows me to help them learn the way they need to learn with the topics they want to learn. My oldest loves loves loves his video games and also spends most of his day playing with friends he’s made over the years. It’s amazing how much he has learned just from playing online with other people from around the world and the topics he comes to us to discuss. Sometimes my mind is blown with the information he has learned just by playing video games. Jessica, I’m so glad you found us too! And you hit on the part that matters most to me – seeing Sarah happy for the first time in years. That’s what homeschooling and specifically unschooling have done for us. What kind of games does your oldest like? Would love to see if he and Sarah share any favorites!! Wow….I’m floored. I’ve slowly moved more unschooling over the last 11 years of homeschooling….mostly because my first is NOT a great reader, NOT interested in “school” stuff, and I’m realizing I have to let him be who he is. It’s terrifying, especially with all those comments I’ve heard (he HAS to have a degree to be successful, he HAS to do “fill in the blank”). Does he have to? Maybe…maybe not. Wouldn’t it be better if he WANTED to go college and got his money’s worth? Wouldn’t he (and the world) be better served if he became an electrician (that’s what he’s thinking right now) instead of doing something he hates because he HAD to?? Yowza….sorry for dumping on you, but MAN, I hate that people don’t get this.